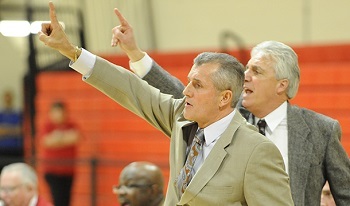 Now the all-time winningest head coach at two collegiate programs (Clark and Anna Maria), Paul W. Phillips completed his 17th season at the helm of men's basketball program in 2014-15. He is the architect of the resurrection of the program, making the Cougars one of the most successful programs in all of Division III. With over 400 career wins and a lineage of developing talent, Phillips is not only one of the most recognizable faces in the world of collegiate basketball but one of its most passionate ambassadors. Since returning to the Clark sidelines in 2006-07 he has taken the Cougars to the NCAA Tournament (2010) and been in the league tournament in five of the past eight seasons. The 2013-14 season might have been one of his finest coaching years as he took a roster that lost ten seniors and graduate students and had just one returning starter to within two games of the conference tournament. During that campaign, he became the all-time leader in wins at Clark (234) after a 71-70 win over Babson on January 29, 2014 - a win that also gave him 400 career victories.